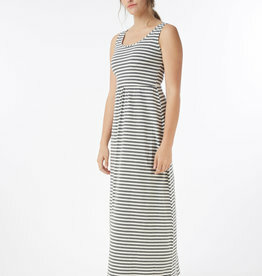 A nursing wardrobe staple, the Must Have tank dress in made for nursing 7 days a week. Designed for the demands of everyday breastfeeding, the Must Have Nursing Dress is crafted with organic cotton and a hint of spandex for shape retention. A nursing dress that represents the epitome of functionality and comfort. Constructed with the empire-line nursing access, the breastfeeding opening is discreet and a breeze to use - especially for first time nursing mothers attempting to establish their nursing routine. This dress's silhouette is shaped to flatter the postpartum figure, and relaxed just where it needs to be, for optimal comfort. A great item for your hospital bag or to have handy when guests come to meet the new baby. Lab-Tested Durability: This dress been tested for up to 20 cycles of machine wash and shows a very low level of pilling and a high level of colour fastness. 95% Organic Cotton: made of organically grown cotton that is certified according to Oeko Tex standards by independent third party auditors.